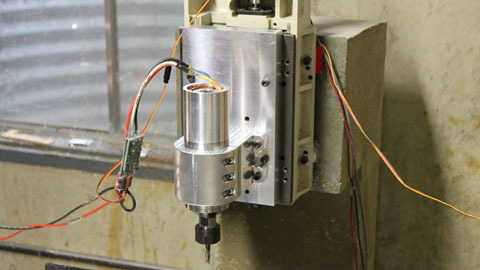 My small home made milling machine needed a new spindle. After searching and pricing a few I decided nothing really fit my needs and I decided to build it. This is the design inspired by a few threads on RCGroups and CNCZone. 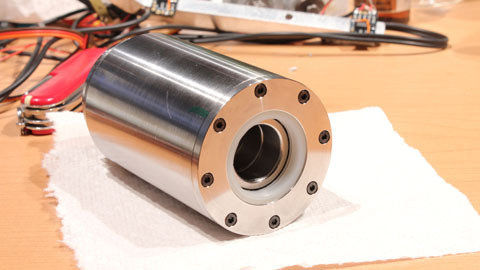 It uses three angular contact high speed spindle bearings and the chosen motor should allow up to 30,000 RPM. I've been using an old grinding spindle and this will be a much needed update. 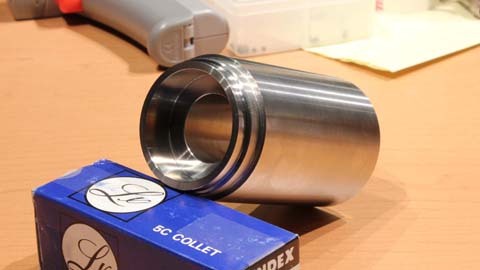 The collet holder is a cheap Chinese unit sourced through Ebay. When the collet holder arrived I was pleased to find virtually no runout on the collet taper as observed with a 1/10ths indicator. This is a Neu Motors 1912/1Y. I took apart a motor I had with a shaft that was not quite straight anymore. 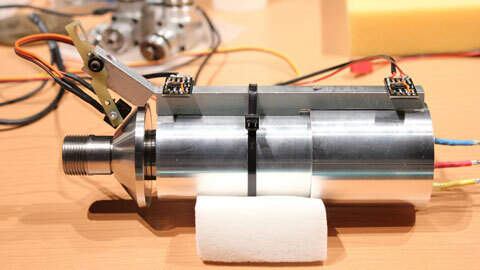 The idea is to add an industrial brushless motor control to interface with EMC2. My initial use will be with an RC speed control driving the motor. If it works and can easily be tied into the machine control, I may not use the industrial control. These are some of the first parts. The body is made of 304 stainless steel. 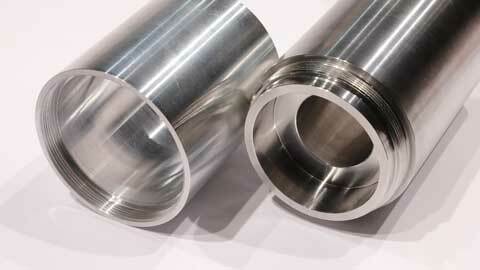 The bar stock is 2.25"(57.2mm) diameter. Lacking a metal band saw I cut it by hand with a hacksaw. 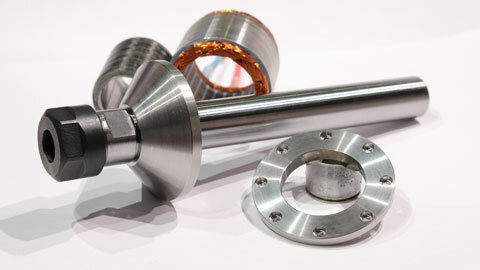 The cone shape piece on the spindle shaft adds some flywheel mass to the rotationg assembly and is the stop for the components fitted to the shaft. I forgot to verify the ID prior to cutting it off and found some taper which was removed with a lap. 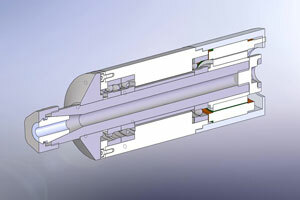 The cone was shrunk fit onto the shaft and was augmented with anearobic bearing mount. 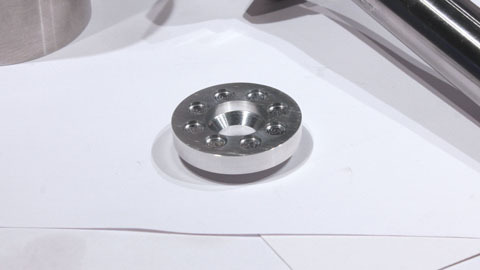 The bearing cap was also made. The body required removal of a lot of material for the through hole and bearing bores. This was a slow process cutting 304SS. 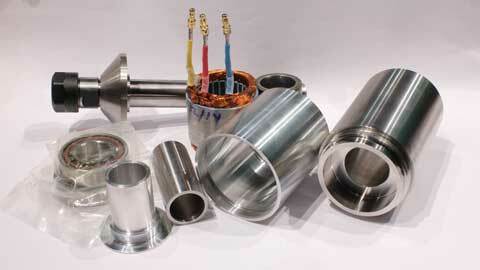 I used inserts made for aluminum turning for most of this work. 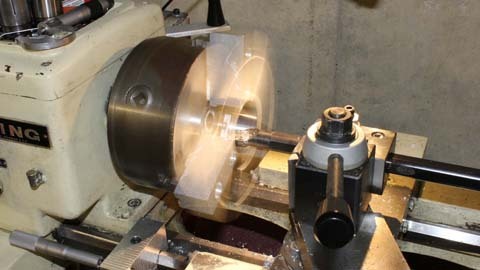 They have a high positive rake and cut with low force which was helpful even on my old 10" Clausing lathe. 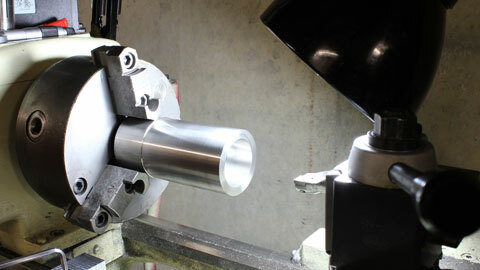 This photo shows one end almost complete prior to final sizing of the bearing bore. I thought my bore guage could measure the 42mm bore, but it only reached 1.5". 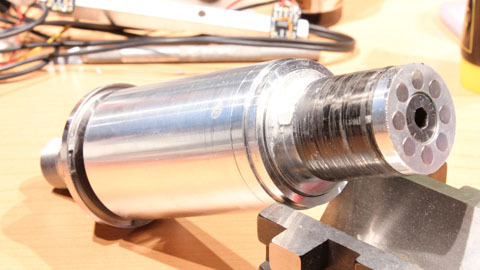 After a new bore gage was acquired, the bearing bore was turned spot on size with no taper. Let's see if I can pull it off on th other end. 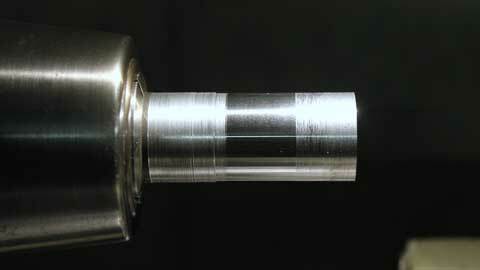 The plan was to grip the OD of the finished side of the spindle body to turn the other end. 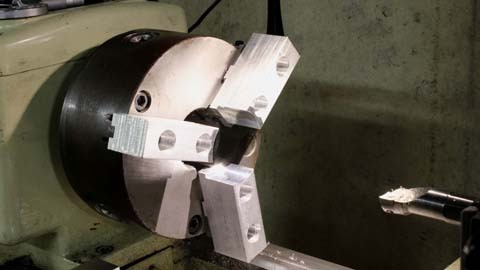 To achieve the concentricity required this was only possible by using soft jaws in the chuck. These are jaws I made from rectangular bar, and it's certainly not worth the time to make then yourself. They are inexpensive enough to buy. This is a pseudo action photo of tunring the jaws. A small round is captured in the master jaws and the jaws are turned to size. Unless you have a three point bore guage use the part as a plug gauge to determine size. After putting the part in I checked it with a .0001" dial test indicator on the OD. Near the jaws there was virtually zero runout. Out where the part needed to be cut off I had .0015". A couple taps brought this to .0001 TIR. Now the real test, after breaking a cutoff tool because I didn't check square, sawing off by hand, and resetting the part in the jaws, I began turning the other end features. The through hole in the housing had been bored just over 3" deep in the first setup. 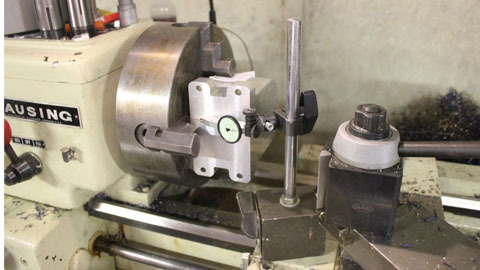 Once I broke through to this bore, I put the indicator on it, to find it was .0002" TIR! Great! Things were looking up at this point. The rest of the machining went without a hitch but for an insert wearing. I hit the dimension within a couple tenths for the opposite bearing bore, so the first one wasn't much of a fluke. This lathe and operator seem to know what they're doing. The body without threads, those will be CNC milled. Yeah crazy, I want metric threads, and this old American iron didn't come with a metric threading set. 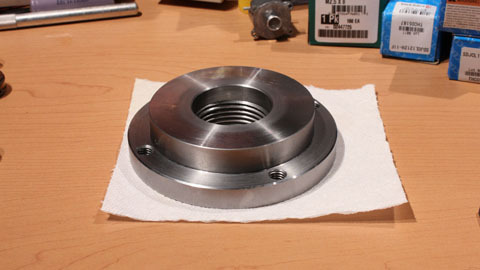 It also still needs holes for the bearing cap in the other end. I stayed away from the machines while I was sick and my head cloudy. I hate to think of what might happen if I made a mistake while working with one of the machines in that condition. 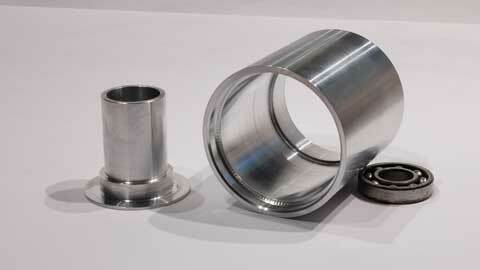 Today, I made the bearing spacer tube that fits between the bearings. I bought some Sandvik inserts and they are very good about specifying feeds and speeds right on the box. So unlike usual, I decided I was going to check to see what gives the best finish. The stock I had happened to be 4340 annealed. The recommended surface speed was pretty high to I set up for low end at ~1500RPM, but started a bit below, maybe 1200. I set my feeds so I could easily change between about .001, .002, and .004"/rev. I tried a few lighter cuts without at any luck at any feed rate. The cuts were the typical draggy cut I had been seeing in most of my steel work. Heeding the recommendation, I dialed the speed up to 1500RPM and .008" DOC. As I switched through the feeds I was blown away. The chips turned blue and the finish mirror-like. Now at 1500 RPM and .004/rev, things move along quickly. This part was 2" long so it was not a blink of the eye, but you had to be on the ball at the end of the cut. The photo shows the different cuts I made. A couple more parts today. On the left, the part the motor rotor will be pressed onto. 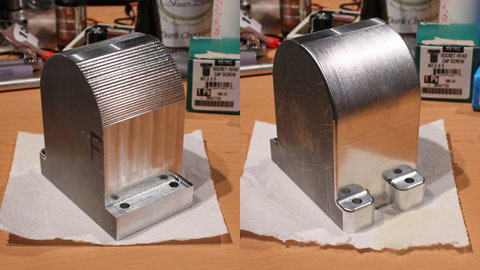 On the right, the motor housing. I picked up some chatter on the ID of the thread relief, it's reflected on the shoulder in the photo. I made some last minute changes to these parts after verifying the dimensions of the stator assembly. I drew the stator from a different but similar motor and this one had larger endturns (wire). Fortunately it didn't have much impact on the overall layout. I still have to pick up a few things. Bearing preload spring, bearing grease, magnets for the hall sensor trigger, some 6004 bearings to use during balancing, and some teflon. I finished the threading today. 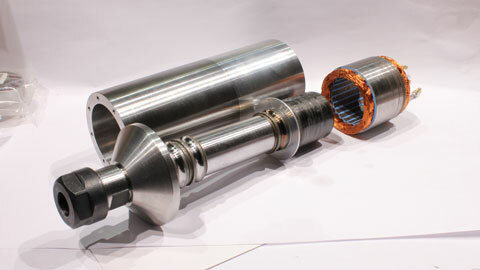 Threads were cut by helical interpolation in the CNC mill, the same mill this spindle will be installed in when done. The two parts fit together with a very close fit. 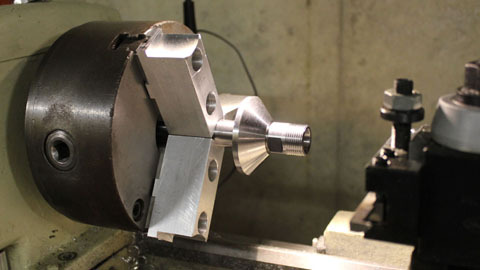 This was accomplished by milling the thread into the stainless body part first, then adjusting cutter compensation while cutting the aluminum motor hoousing until it fit. I had made the thread relief too small in the body so it needed touching up in the lathe. I checked the fits of the bearings in the body and the rear floating bearing got tight a little more than half way into the bore. A bit of sandpaper while spinning in the lathe loosened the fit. These are the parts going into this spindle. A few parts are not in the photo. Most notably, the bearing clamp ring is missing. 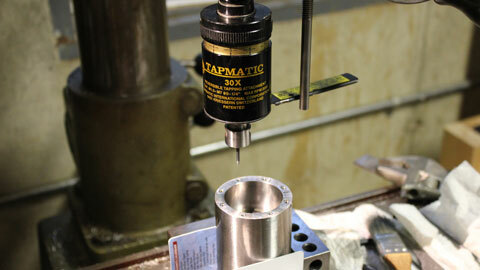 I spotted the screw holes for the bearing cap in the little CNC mill. Due to the limitations I have now with the spindle it was just a tiny spot. This was plenty to transfer over to the Arboga for drilling. I purchased, in the last couple months, a Tapmatic tapping head. Thread forming taps sound like the best thing since sliced bread so I decided to give it a try. I purchased a few OSG thread forming taps of their least expensive variety. I followed Tapmatic's instructions for setting up the feed depth and stop on the mill. It went off without a hitch. The best thing is, no chips to clean from the holes! Youtube tapping video. 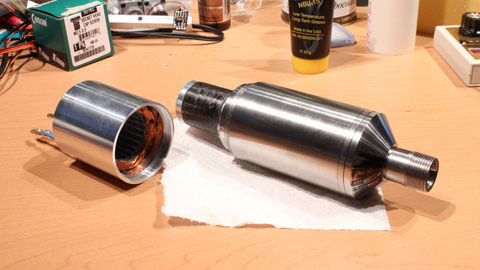 I've assembled some donor inner races of the same size as the actual bearings that will be used onto the shaft. 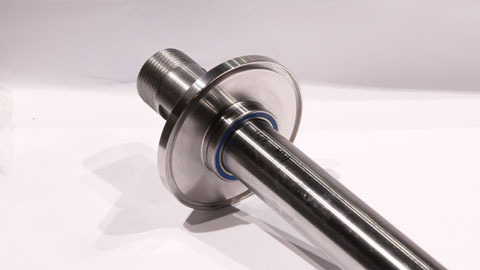 The shaft is assembled with all the rotating components prior to balancing. After balancing the orientation will be marked so it can be reassembled the same way. The balancing fixture will be a simple device. I've read it's possible to do a very fine balancing job without the aid of electronics. I guess I'll find out. I spent some time thinking about balancing and decided it needed two plane (dynamic) balancing. I found a software that is reasonably priced for the hobbyist. I also added a groove in the back of the cone to allow adding some balancing putty. This was something I didn't put much thought into previously. 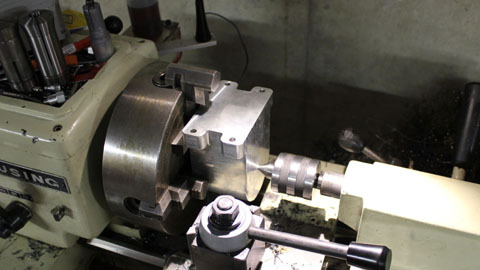 2/8/2012 This is the setup for dynamic balancing of the spindle. I used Miklos Koncz's DynamsPro software. A pair of accelerometer boards and an optical tach sensor to provide the necessary signals to the software. I'll add details of the balancing later. 2/9/2012 This is the result of the balancing. Some balancing putty is visible in the groove in th back of the cone. 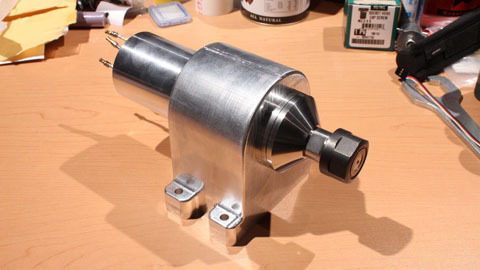 Putty was also added toward the collet end just below the black motor rotor. It got washed out in the photo and is hard to see. The motor end needed a lot of mass to balance, but it did. I also removed some material from the clamp ring with the magnets, this was probably unnecessary in the end. 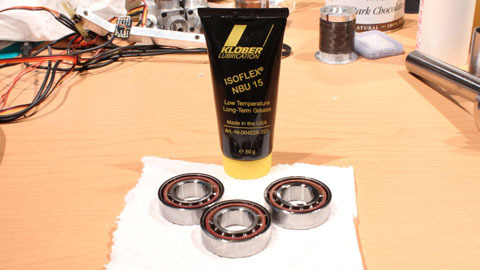 Kluber Isoflex NBU 15 and the three Barden 104HDL bearings. 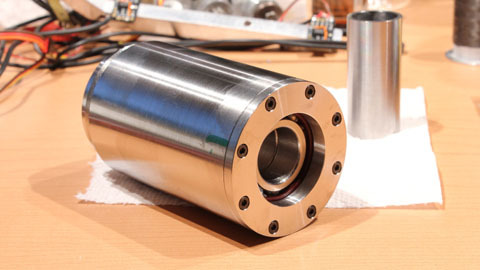 The bearings are rated to 36,000 RPM with grease. 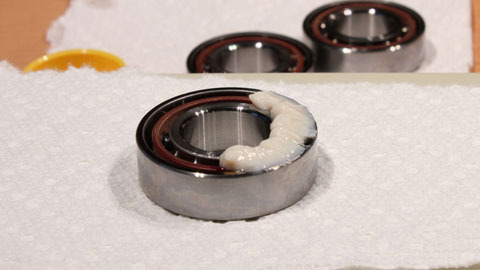 0.9 gram of lubricant was packed into each bearing. A pair of bearings is installed back to back in the nose of the body. The clamp ring fit well and left just a small gap to the body. I made a nylon labrynth seal to fit the clamp ring. The nylon sprung while I was turning it and even though I accounted for this, it was still a tight fit on the shaft. I recut it to clear the shaft. 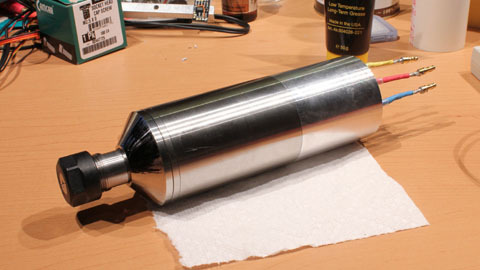 This is the assembled spindle body. 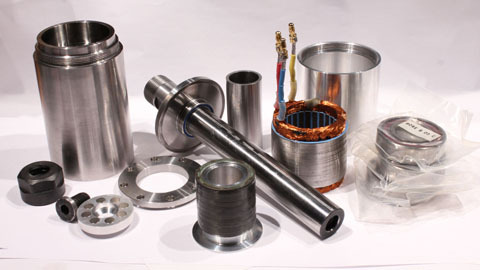 Inside the body is the bearing spacer, bearing preload wave spring, and the upper bearing. Over that fits the motor rotor(magnet assmebly), and the clamp hall magnet assembly. One screw holds it all together. During reassembly, I took care to clock the parts as I had them during balancing to preserve the balance. 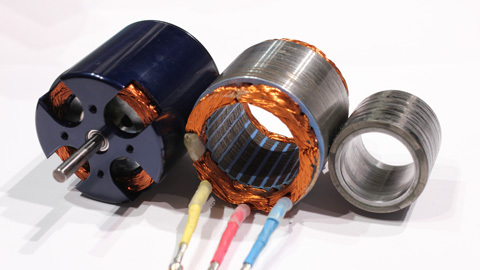 The motor stator threads on to the body. It only needs a motor cover that will have a fitting for compressed air to provide some cooling air and potentinally the hall sensors if needed. It runs very smoothly and I'll check the balance to remove the tiny imbalance left at the motor end. 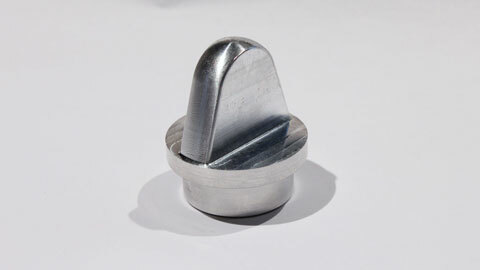 The collet nut is a standard unit and will be balanced as well. Balanced ER16 nuts can be purchased, but they are fairly expensive. 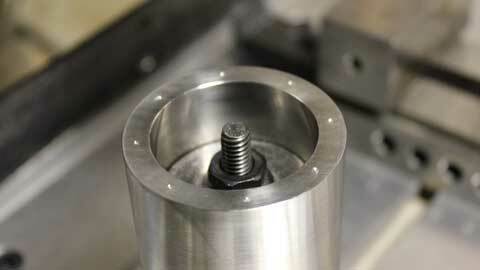 A new spindle mount is necessary to mount it. 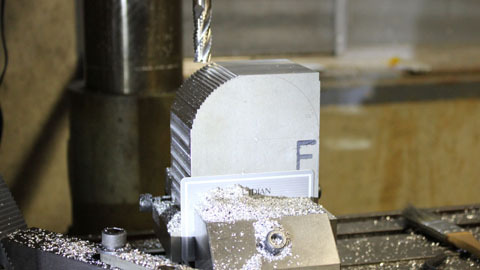 I started out with a 4.25" x 5.25" 2.65" block of 7075-T6 aluminum. The mount might a bit too large, but it's better than too small. I hogged it out on the manual mill. March 5, 2012 The first cuts!